For many surfers coming to Telo Lodge, part of the fun is fine tuning the quiver, considering which boards to bring over. 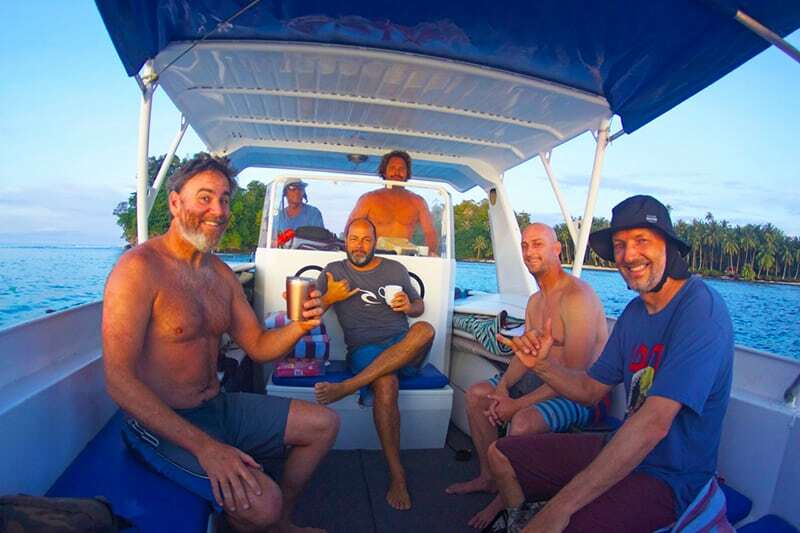 If you’re Matt Biolos – legendary founder and owner of …Lost Surfboards, a trip to Telo Lodge is a chance to mix a surf holiday with some field testing of his epic creations. Of course, to run 30-odd shooters through their paces you need to bring a solid crew of comrades along. Let’s meet ‘em! Mike Riola, from San Clemente California. Matt’s … Lost Surfboards partner. This was Mike’s first surf trip in 15 years and he’s still got the touch, despite getting cooked by the Telo sun! Pete Mathews – the laid back charger who lives in Bali and runs …Lost Indonesia, in addition to owning the White Monkey surf shop at Ulus. Lucho Soto, from Chicama, Peru. Lucho is …Lost’s Financial Fella and after accounting for every rippable left he could paddle into, Lucho would then celebrate with 11.00 am Bintangs. Sasha Stocker …Lost Australia’s Sales and Team Manager, from Hastings Point,NSW. Sasha’s an ex-pro who still has that special something when he surfs. The kind of guy you just want to watch. Ben Kelly, from California, …Lost USA’s General Manager, another bloke who can really destroy a left. Pete Saari from Washington State: a great skater, snowboarder and fella. Owner of Lib Tech Snowboards. Max’s Left pumped pretty much for eight days straight, bowling beautifully on the inside, which allowed the fellas to surf the hell out of all the boards they had at their disposal. Matt led from the front with his backside whiplash blowtails. We mixed it up with strike missions to GT’s, LeBa and Kindies, and good old Max’s Right was always there for us out the front, but when Max’s Left is like that, it’s hard to pull the pick and motor away. Everyone’s heading home today with sore shoulders, exhausted legs, and intimate knowledge of the ins and outs of what we reckon is the best quiver in the world. Boards you’d swear were made for our waves here in the Telos.